In 1963, Sandy Grant Gordon, the great grandson of our founder, was brave enough to take the Glenfiddich Single Malt beyond the boundaries of Scotland thus establishing the Single Malt Category. To honour Sandy’s game-changing decision, our malt master, Brian Kinsman, has recreated Glenfiddich The Original with the recipes uncovered from our family archives. In honour of the release of this Limited Edition in Australia, we are celebrating three unique local families whose businesses reflect the same passion and heritage that we do. It is this shared passion that makes them feel very much part of our extended family. Find out more about their stories below. 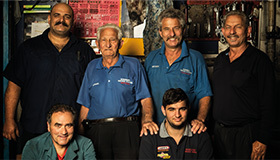 The Carayannis family has been running the inimitable Rosebery Service Station since 1926. It was one of the first service stations in Australia to take inspiration from the American “Drive-in, Drive-Out” service stations. Almost 90 years and three generations later, the service station is still in operation, providing a “hands on service” for customers, with family members pumping petrol, putting air into tires and even cleaning windscreens. In 2015, the experience shocks many first time customers. You might call the family purveyors of the traditional, having kept the same business model today as in 1926, when they first began. Currently, three different generations of the family work at the station, At 85 years of age, Michael is still working daily as the Head Mechanic. His son, Del is Manager of the service station, while Michael’s grandson Evan is currently an apprentice in the workshop. The family is made up of Glenfiddich enthusiasts, including George Caryannis who works as a mechanic in the workshop, consuming the whisky regularly. 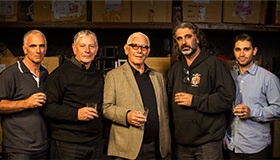 The Couche family has been running one of Sydney’s most cherished watering holes since 1983. Located in Paddington, the iconic pub has remained in the family for 3 generations. Family patriarch Jamie has recently shifted the day-to-day operations to his three daughters. 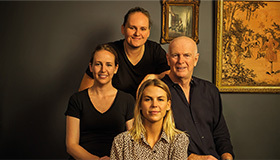 Eldest daughter Honor is General Manager, while sisters Kate and Claire both have central roles at the hotel managing functions and the cellar. For their Glenfiddich whisky tasting the Couche family will be toasting to “future success as a family.” The Lord Dudley is arguably one of Australia’s most famous pubs, having been the hotel of choice for countless celebrities since its founding in 1884. Legend has it that world famous boxer, Les Darcy, even used the basement area of the pub (now the garden restaurant) for his sparing matches. This display was by Celestino Foti, who, with son Sam, bought and operated Vulcan Fireworks, later changing the name to Foti Fireworks. Celestino’s family has been in the firework business for over 200 years, bringing their technology from Italy to Australia. Since 1969 Foti Fireworks has been the biggest and most pioneering provider for Sydney entertainment. The family has created defining moments of a generation, lighting up numerous events such as the Sydney Olympics and the Sydney Harbour Bridge on New Year’s Eve in 2000. Now 2015, the family has produced fireworks displays all over the world, including Turkey, China, Germany amd Canada. Sam, the family-man behind the business, still assists with day-to-day operations while son Fortunato directs the infamous NYE displays on the Sydney Harbour Bridge. Tino Foti is incredibly proud to be a part of the Extended Family campaign and is excited to share a special moment with his family at their private whisky tasting. In 1963 Glenfiddich Straight Malt was the first Scottish single malt to be actively marketed internationally, creating an unheard-of worldwide demand for single malt Scotch whisky.